Going north on 99 to Fresno, take the Kings Canyon 180 freeway east (not Kings Canyon rd. ); then take the Clovis/Huntington Lake 168 freeway and just follow the signs to Shaver and Huntington Lakes. Take 99 south to Fresno; exit the Kings Canyon 180 freeway east; then take the Clovis/Huntington Lake 168 freeway east, and just follow the signs to Shaver and Huntington Lakes. Take SR 41 south to Fresno; then stay on the Yosemite 41 freeway and exit the Kings Canyon 180 freeway east; then exit the Clovis/Huntington Lake 168 freeway east and just follow the signs to Shaver and Huntington Lakes. 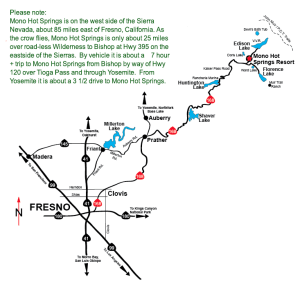 Although it’s only about 85 miles from Fresno to Mono Hot Springs, allow 2 1/2 hours driving time. From Huntington Lake to Mono Hot Springs: Upon entering the Huntington Lake area (about 20 miles from Shaver Lake) watch for the large Mono Hot Springs exit sign to the right (16 miles to Mono Hot Springs). If you end up at Lakeshore Resort, you have missed the Mono Hot Springs exit by about 1 mile. The first 5 miles of the Kaiser Pass road is a nice smooth two lane highway; then the last 12 miles turns into a rather narrow and curvy more or less one lane road but paved. You can only drive about 20 MPH. There are only 3 areas that are cliffy. Don’t let the road bother you, there has never been a serious accident on the road for the last 80 years. There are numerous turn outs along the road but sometimes when vehicles meet, one vehicle has to back up a little for a turn out; it is usually best to back up past the turn out using only your side mirrors and then drive forward into the turn out. Along the way, especially once over 9,300 ft. Kaiser Pass, you are in a different world; there are many scenic turn outs to view some really spectacular Wilderness scenes. After going about 8 miles on this road you will see a small Forest Service Ranger Station to the left, and then two miles ahead watch for a sign directing a left hand turn to Mono Hot Springs that’s only 2 more miles; if you keep going straight you will end up 6 miles away at Florence Lake (the end of the road). From Huntington Lake, depending on traffic, figure on a one hour drive to Mono Hot Springs. Rancheria Enterprises (closes 6 PM) at Huntington Lake is your last stop for gas. You should fill up at either Shaver Lake (24 hr. Gas) or Rancheria. No Gas is sold at Mono Hot Springs or anywhere past Huntington Lake.